The Dialogue is something we started almost two years, but unfortunately have been very inconsistent with it. This changes today. We’re relaunching ‘The Dialogue’ with a new long form feature, a first of many lined up for this year on Beautiful Pixels. We spoke to Michael Simmons of Flexibits at length about calendar apps, Apple as a company and its influence, UI Design, HockeyApp, and more. This interview was conducted little over a month ago and is the longest article we’ve published here on Beautiful Pixels. There’s a handy Index below for you to jump into topics of your choice if you want. Let’s go back a few years to when Flexibits was founded. Michael tells us how he had been friends with Kent and started working together much before Flexibits was a thing. He also talks about how they got incorporated on a very interesting date. Speaking of things in the past, Chax for iChat on Mac was a huge deal when it launched and was one of the first few projects that Michael and Kent worked on together. It is very important in Flexibits’s history and highlights their working relationship and why they decided to come together as Flexibits. 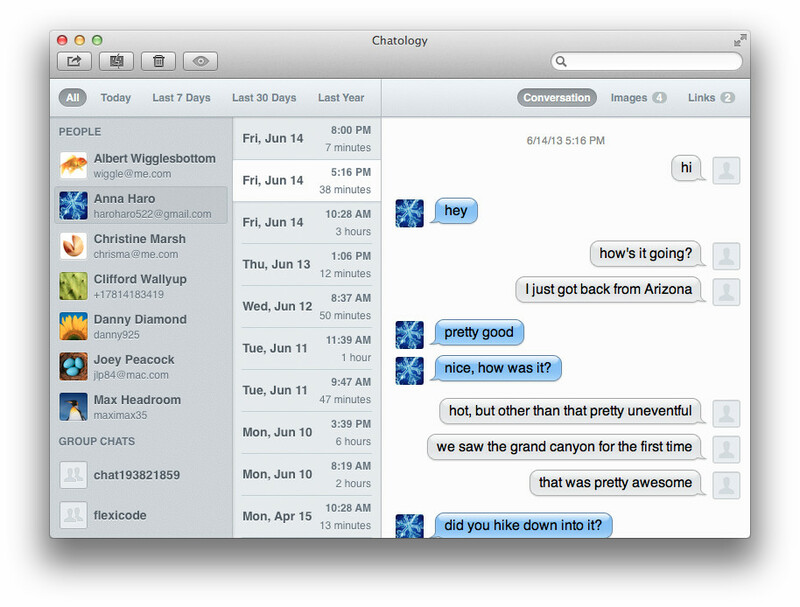 Chatology is like the spiritual successor to Chax for modern Macs. Michael explains how and why they still work on the app, despite it not being successful for them. Some things are made just as a labour of love. “Chatology came out of the original relationship that Kent and I had with Chax. Chax was something that I always used for iChat and then of course Messages eventually came into being. And Chax stopped working because of other changes that occurred with OS X. With Kent and I becoming busy with Flexibits, Chax just kinda died. But I always craved a message log viewer, because I was always looking for a chat. And the search in Messages was always busted where it would beachball or I could never find what I was looking for. And I always kept pestering Kent to make Chax again. He told me it would take a lot of time and effort, but I would always just keep bringing it up and he would keep saying no or it’s not really worth the trouble. Eventually I just said OK, let’s just make a really powerful chat log viewer with no other feature. Kent was on board, and we started making it. We knew well and good that it wouldn’t be a huge success like Fantastical, and that almost made Chatology not exist because we said why are we really spending all of our time on this thing that we know won’t be successful? We think it’ll be popular, we think it’ll be admired, we think it’ll be useful, but we don’t think it’ll be a top app. And another thing that also threw a huge complication in was the fact that we need to searching a specific location, which is against Mac App Store rules. There are potentially other ways to work around this, like by putting up a dialogue and kind of showing a user how to select the folder. But this would harm the experience, which negates the whole purpose of the app. But the point is going into this app knowing we can’t sell on the Mac App Store, knowing it’s not a mass market popularity, makes it kinda silly to make, right? And that’s the thing, it took a few months, and it wasn’t a small project. We had to figure out the log format, how to scrape it, we had to get the messages, and the images, and the links. It’s actually a complex app. Now that it’s been out a while, I’ll just say this. It wasn’t a successful app, but it was a popular and admired app and the people who need it, use it and love it. It does make us some extra money, so obviously it is still extra income, but best of all I now have the app I wanted." Ever since it was founded in 2010, Flexibits has evolved considerably. Michael gives us some insight into how they started out and how Fantastical 1.0 was when it launched on OS X.
Mikhail: I discovered Fantastical way before I joined Beautiful Pixels. I was at Preshit’s house and he was telling me about his frequently used apps and Fantastical obviously caught my eye. It really was magical seeing the words flow into place when you typed in an event. Michael weighs in on what he thinks made Fantastical successful from the start and how the little delights are important in apps. We think the Natural Language Parsing, combined with how the words float into place is what made Fantastical what it is today. The NLP in Fantastical has gotten so much better over the last few versions of the app and Michael talks about the importance of localizing everything in your app versus just the static bits. “When we launched in 2011, we only had English. As of today, we have English, French, German, Italian, Spanish, and Japanese. And there’s full support for all of those languages, with not just a localized UI, but also a fully language-aware parser. We do get a lot of requests for other languages, but we have to be very selective because it is a lot of work. It is not just simple UI localizations. Some users have asked us just to localize the UI for certain languages and we intentionally won’t do this. Because if we were to localize the UI into a language and the parser didn’t understand that language, it would be even more confusing. So we are very very careful about not localizing the UI unless we have the parser localized. It takes a lot of effort. The parser has also gotten much more intelligent. We added the ability to select a specific list, like “meeting Thursday 5pm /w” will put the event into the work list. We added more flexible repeating events like “meeting every third Thursday of the month” and more holidays. If you say like “cook hamburgers on Independence Day” that will work. We also added time zone support, so something like “meeting with michael 11 am pdt” also works as you would expect. We always want to make the parser better. When users tell us something isn’t working, we try to improve it. After 4+ years of refinement, I would say our parser is incredibly good. 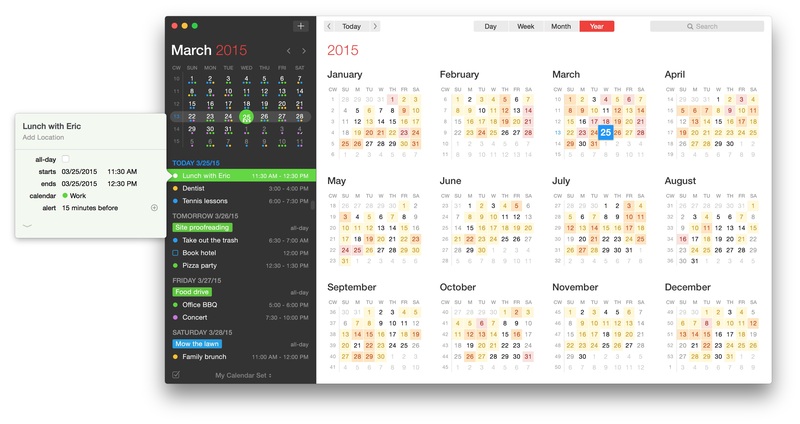 Especially Fantastical 2 for Mac, as it was the biggest upgrade of them all. We took those improvements and also brought them to iPhone and iPad. We make sure all versions always have the latest parser improvements. You will never get 100% on a parser just the same way if you talk with another person and say a bunch of things, someone will eventually be confused. We are really really close to as good as possible, but we always look for ways to improve things. Competition is what makes some people stay on their toes. Michael’s views on the competition are quite different. Even apps that have similar features or more features aren’t a big threat for him for a variety of reasons. “User interface and experience is our most important thing. You could have an amazing User Experience and UI, but if it doesn’t do anything helpful, what good is the app? The NLP is what made people want Fantastical, but the UI and User Experience is what made people love Fantastical. Around the time we were getting ready to ship, we actually discovered another app that was out there that did “event quick entry”. It was originally a dashboard widget, if I remember correctly. We didn’t know anything about it until we were getting ready to ship. One of our testers told us about it towards the end. It was similar to Fantastical, in the sense you would type in a sentence and it would convert it into an event. It didn’t have a calendar or floating words. It didn’t have the whole experience like we did. It was literally an input box. Once you added the event, you didn’t even know where it went. No context. When we were building Fantastical, we knew we had to be a menu bar app. We knew a quick access menu bar app was the way to go. Our original design was just gonna be — type in the event, see what it was going to be, show the output, and be done. We weren’t going to have the calendar or list or any other functionality there. This is way before I knew the other app even existed. What is interesting about this is that I knew then, if we were only going to have it to create events, no one will use it. You would still have to go back to iCal to see or change or edit it. We needed to create an experience that people would want to use, because if someone doesn’t remember to keep using your app, they wont use your app. I got to sketching and thinking and realized we needed a calendar. I also wanted to be able to have a list with events. I wanted to be able to show the details and on and on and Fantastical was born. Fantastical, again, was built on NLP. However, now we are in a day and age where there’s just a ton of expectations. People expect NLP. I don’t think other apps that have NLP are a threat to us. I think our User Experience and UI is the key reason people love Fantastical and I think our parsing engine is the best. I haven’t looked at the competition, but I know how solid ours is. I know how much thoughtfulness we put into it. I know how friendly and powerful it is. I just cant see anyone’s being that close. Maybe there are some that are better, but I know that from our experience and everything we do, I highly doubt theres anything as good as us." Michael talks about borrowing and improving features versus plain stealing and why Fantastical is what it is today. He also talks about patents and whether Flexibits would get involved with litigation for patentable features. “Yes, we have seen other apps copy us or be inspired by us. Calendar apps with NLP are sort of inspired by us. We were the first on iPhone that I know of. Then there are some apps out there — I don’t want to name them, but they blatantly copied our floating words. Our floating words — that was our original idea. It actually was a patentable idea. But we never thought to get a patent because we are indie developers. Have you seen any other app where you type something and the words float to tell you whats going on? (Eventually) we did a patent search, but it was too late. You have to file one within 1 year of it being public, so we couldn’t file the patent. And the other app thats out there copied the floating words, they didn’t change or improve it. They literally copied it verbatim. And that’s when we started to look to see if we have a chance at patenting it. We have learned that maybe we should patent things early. However, even if we had a time machine, I actually don’t know if we would’ve patented. I don’t know if we would spend the time and money to sue people. It is probably just better to ignore and keep making great things. If they are copying us verbatim, then they don’t have any original or better ideas. If they took the floating words and improved it in some way, with sounds or something, well, I don’t know what, then I’d say, “That’s pretty cool, look what they did.”. With improvements, it would mean they were truly inspired by us and they made it better. But when you see someone steal something blatantly, I think it’s sad that they didn’t have their own idea so they literally stole someone else’s. Great artists steal, but what this means is that you take something and make it better. Taking something without improving it is just thievery. A lot of people assume OS X development won’t be worthwhile because of its minuscule market share compared to iOS and also because of how some apps are treated on the Mac App Store with Apple’s restrictions. Michael talks about how important the Mac App Store is to them and how their Mac app has been so far in terms of success, compared to Fantastical for iPhone or iPad. Speaking of the App Stores, Fantastical is almost always featured by Apple on both iOS and OS X when it receives a major update. Michael says that this impacts sales positively, but isn’t the only thing developers should rely on for success. We start discussing WWDC ’15 and the announcements Apple made at its annual developer conference. Michael shares his thoughts on the announcements and why this particular WWDC was super special for him and Flexibits. I asked Michael if he knew Fantastical 2 had won the Apple Design Award before the Apple Design Award event. Speaking of WWDC, the Apple Design Award for Fantastical was interesting in terms of how it affected sales numbers but also for how they presented the award. Apple showcased how much they loves developers taking advantage of all their devices in the ecosystem. “What was interesting about the ADA this year is they did give it for Mac, in the sense they demoed it on stage and spoke about it for Mac. But they made it very clear that we had other versions, as well. I don’t believe they did this in the past. If you won for iPhone, they only would talk about that. This year, they talked about the whole ecosystem for our app. iPhone, iPad, Apple Watch, and Mac. They even listed all of our versions on the website, which was great. And they should. Fantastical is only for Apple and we support their ecosystem, so why wouldn’t they want to promote that? Being involved with Apple Design Awards is one thing, but actually winning one for your own product is super special. Michael has worked at various places that have had the privilege of winning ADAs, but this one for Fantastical was his own. When iOS 7 was released, there was a huge backlash on social media and on the App Store reviews because some people weren’t happy that developers released new apps instead of updating existing ones to fit in on iOS 7. Some apps suffered heavily on the review front, but Fantastical 2 for iPhone shot to the top of the charts and had glowing reviews by the press and users. Michael weighs in on the importance of charging for your own hard work and supporting it. 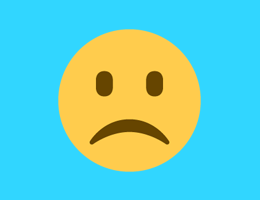 The negative people who complain about paying for updates or apps are a vocal minority according to Michael and need to be ignored to sustain the business. “The thing I always like to tell fellow developers is never ever listen to the customers that are complaining in the sense of wanting stuff for free or telling you that you are too expensive or they’re rude or disrespectful to you. Those are not the people that you want as your customers! I get asked this a lot on podcasts and in interviews because I’m successful. I want to make everyone happy and when I see someone upset with my pricing or a policy, it does upset me so I try to figure out how I can make things better. When someone basically says, “Screw you, I want it for free.” or “it is just an app”, they aren’t worth bothering with. We had one person who was so rude and said, “Fantastical isn’t even a real thing, it is just 0s and 1s”. I’m 100% serious. The thing is, these kinds of people will never understand what goes into making an app. You do have to kind of accept it. This person doesn’t understand what we do for a living and how much time and work and effort goes into these apps. Not only that, the focus and talent it takes in general for app developers. You’re never gonna please those people. But if you were to try to please those people, now you are catering to that kind of person. And that kind of company will never stay in business. Deviating more from what most developers — including Apple — do with their apps, Fantastical is one of the few apps that has separate iPhone and iPad versions. Even a big name productivity app like OmniFocus is now a universal app. When the original iPad launched, a lot of apps either went universal or had “HD” versions for the larger screen. Flexibits have been adamant on keeping both iOS versions separate and it has benefited both the users and the company in the long run, says Michael. “So the whole Universal debate is a pretty hot topic for us. We are one of the few developers that have separate iPhone and iPad apps. There were some others that had them, but I noticed the trend has been to bring them together. We have been very firm on keeping them separate for a bunch of reasons. One reason is the fact that we believe if you make apps separate, in design and intent, the app comes out better. You don’t view it as Fantastical for iOS with the big screen version and small one. I think if you actually make it for iPhone and that’s the app, and you make it for iPad and that’s the app, you make a much better app on each platform. Another issue about making an app Universal is when you actually go to price your app, you have a problem. What price do you make it? Because an iPad app needs to be more money because there are less iPads and I also believe that an iPad provides more functionality. And more functionality means more design and implementation, which means more work and effort, which in turn requires more compensation for your time. iPad apps should be more expensive. Now you have your iPhone app that should be priced lower and iPad app should be higher. So, how do you price it? Most people don’t want to pay a lot. If you make the price close to iPhone, then you are losing money of the iPad version this way. If we were to do Universal, we wouldn’t be $4.99. We might be $7.99. But then a lot of people who only own an iPhone might not want to pay more. And a lot of people who buy an iPad might have paid $10 on iPad. So now we’re losing the money on the iPad customers. We’re losing the money on the people who don’t want to spend more than $4.99 on a Universal app. I think you are able to make it clearer and better by making it different. We do believe, and actually based on feedback that the people who actually do want both, they value our apps are happy to pay for both. We would love for Apple to do a bundle that allows you to bundle iPhone and iPad apps, but we don’t believe this will ever happen because Apple prefers Universal apps. Michael now explains why he thinks Apple wants and expects developers to go universal on iOS. The early days of the iPad made developers try new things and even Apple wasn’t sure how to handle their own apps on it. He believes iOS 9 will finally make developers give the iPad the respect it deserves with the great new features introduced at this WWDC. ”In the early days the iPad, I think even Apple didn’t know what to do. Foe example, the whole calling apps for iPad as “HD” was nonsense. I have a problem with taking an iPhone app and blowing it up to iPad. I think that is really a cop out. I think it is also a reason why iPad has not reached its greatness yet. I do believe iOS 9 is going to help iPad reach greatness. Some of the iPad features, in fact those announcements at WWDC ’15 were my favorite announcements at WWDC. I love the iPad — I think it is an amazing platform. I feel like it has been lacking in tools and abilities. And iOS 9 is gonna turn that corner. That being said, back to the HD thing, I just feel like all this whole idea that an iPad is a bigger more beautiful version is bad because it is supposed to be a better version. It shouldn’t just be HD visually or bigger. It is supposed to be more functional. More experience. More productivity. More features. To clarify something important: if you make an iPhone app and the iPad app is simply a blown up or larger version of the same iPhone app then you should not be charging for the iPad version. It should be a Universal app. If we were to make Fantastical for iPad literally a blown up iPhone app where, let’s say, it had the same features with no additional usage of the screen and landscape only with a long DayTicker and list, then we would have made it Universal. This (Fantastical for iPad) looks better and is native. The iPad version was completely reimagined for the iPad compared to the iPhone app. It took a lot of time and work and it provides a lot of productivity and features, so therefore is a separate app." Michael travels a lot. He has a love for Japan (as does Mikhail) and talks about what made him fall in love with Tokyo and how important a market Japan is for app developers. New developers need to be aware of the current app situation and how much work goes into making a great and successful product. “Set your expectations properly. It is not just a gold mine. Even with many successful apps, I’m still very aware of how much work and effort, and to an extent, how much luck and timing is involved. It isn’t a ‘Get Rich Quick’ scheme, it is a lot of hard work. While many people will have you believe that the get rich quick train has long gone, Michael says it has always been hard for developers right from the inception of the App Store. We are glad Apple has taken stability and performance seriously with iOS 9 and OS X 10.11 because both platforms needed them. The future of both platforms looks great and Michael talks about what he would like from Apple in the future. Apple is the reason a lot of people became developers and their philosophy has influenced far too many people. Michael talks about his early days with Apple products. He also weighs in on inspiration versus blatant copying with software. HockeyApp is one of the most essential tools that any developer uses these days. Michael tells us how he came together with Thomas Dohmke, Andreas Linde and Stefan Haubold to build a solution to install ad-hoc builds on the iPhone. The story of how it was named is also quite interesting. “The solution for how to install beta software, how to install ad-hoc builds on to your iPhone, was actually first done by us (by one of our founders, Andreas Linde,) and Andreas was someone that I met while working at Cultured Code. After I left Cultured Code, he left shortly thereafter. He had been experimenting with, and he was first person that I know of,how to make ad-hoc builds for beta testing. And he created a project. The first thing he did, was create an app called Mac crash reporter. HockeyApp was born from that project. Microsoft has been great with acquisitions recently. They actually let their products live on and even improve in many cases, unlike Google. Michael talks about Microsoft, HockeyApp getting acquired, and the future of it. Outside of Flexibits, Michael does consulting for a few companies. “The consulting that I do is for business development, user experience and user interface design of an app and product management. I do advise on PR, where I give my clients input and tell them how to improve their coverage, but I don’t specifically or exclusively deliver PR services. I did work with Microsoft for a while after the deal closed for a transitionary role, but I didn’t want to work there full time, so I no longer work with Microsoft. But I still am advising two other companies: Algoriddim with djay and I advise AgileBits with 1Password. So it is Flexibits and the two companies I advise. Flexibits gave us one of the best productivity apps ever with Fantastical. Michael talks about how email is super important to him and how he manages email among other tasks and is basically productive during the day. This is what an average work day in his life looks like. We always love hearing what apps our favorite developers use. These are the apps Michael uses the most on iOS and OS X. We would like to thank Michael for his time and patience for doing this and while we worked on this. We can’t wait to see what Michael and Kent do with Fantastical in the future. We hope you enjoyed reading through this mammoth interview and would love to hear some feedback about it. Would you prefer long form content like this or are long articles better when split up across multiple posts? Let us know.